← We love the anti-christ! Imagine that you decide to rent some dune buggies with some friends. You drive for hours and hours out to the desert with a bunch of them to find some dunes to jump. You are having a blast! In your excitement, you get separated from the group without even knowing it. Jumping dune after dune, you get father and father away. After about 5 hours of non-stop fun that has only seemed like about 15 minutes, you realize that you are low on gas. You stop the dune buggy and decide to get some water out of the back because you are extremely thirsty. When you look in the back for some of the water you brought with you, you realize that the small cooler that you had in the back holding your water is no longer there. It must of fallen out when you were jumping dunes! To your horror, you also realize that your duffel bag with your cell phone, wallet, etc must have fallen out as well because it is not their either! As you survey your surroundings, there is nothing but sand and hills. No tire tracks are left in the sand for you to retrace your journey. You are becoming dehydrated in the hot desert sun and a little confused. You can’t tell from the sun as it starts its journey to the horizon which way North is. Or south . . . or East . . . or West . . . You are panicking. You search the horizon desperately! Wait! What is that off in the distance? Is that trees? You haven’t seen trees in the last 5 hours. Trees need water to stay alive, Right?!? Your reasoning is a call to action as you hop in the dune buggy and head for the salvation they will bring with the pedal mashed to the floor of the dune buggy. It is not a mirage! They are really trees!!! Shelter from the intense heat! More importantly, the promise of much needed water! When you get to the trees, much to your surprise, you see a well right in the middle of them . . . you are saved!!! You jump out of the dune buggy as it rolls to a stop sputtering from lack of gasoline. In a dead run, you head to the well and lower the bucket as fast as your hands can turn the crank. It hits the bottom with a thud! Groan . . . it is a dry well!!! In the letter 2nd Chapter of 2nd Kefa (Peter), we continue our study as Kefa continues his assault on the false teachers. He calls them “fountains without water” or πηγή ἄνυδρος pēgai anudroi. Barren wells were worse than useless; they promised water in the arid East yet did not deliver on their promise. Waterless springs promise good but are in fact useless. They falsely raise our hopes and then deliver nothing. David H. Stern, Jewish New Testament Commentary, (Clarksville, Maryland: Jewish New Testament Publications, Inc., 1992), WORDsearch CROSS e-book, 761. The message they give promises salvation, but does NOT deliver! broken cisterns, that can hold no water! Hell was sometimes described as outer darkness. Kefa has just told them prior to this about the insanity and madness of Balaam (the prototype false teacher) and people who wander off the straight path to follow the way Balaam. To drive the point home, he tells them they are abandoning the Living Water for empty, useless promises of water from dry wells – broken cisterns which can only bring death . . . and he tells his readers yet again, in case they are being thick in the head, that the false teacher is headed to hell . . . not just hell, but the darkest and gloomiest part of hell according the the Greek meanings of the words used! being tossed and driven by the wind. 8 because he is double-minded, unstable in all his ways. If you are listening to false teachers, you WILL be tossed here and there. If you are listening to false teachers, you WILL abandon the Living Water for dry wells. If you are listening to false teachers, you WILL be double-minded. If you are listening to false teachers, you WILL have doubt and be unstable in all your ways. YOU ARE BEING LED TO THE SLAUGHTER! Sadly, if you are being led to the slaughter, you are doing so willingly! Just like Eve, you are picking the serpent’s lie over God’s truth! You are picking the dry well over the Living Water! Brothers and Sisters, do you think Kefa (Peter) wrote this letter with these warnings just to spout off? Maybe I should put it a different way. Do you think the false teachers preaching the prosperity gospel of today are more inept than Balaam and the false teachers teaching a prosperity message 2000+ years ago? REALLY?!? Did Balaam have a marketing degree from a university, Internet and 5 million dollar worship centers with coffee houses? Did the false teachers of Kefa’s day have You-tube and Facebook to propel their promises of wealth? Did they have slick worship bands with rotating stages and several hundred thousand dollar sound systems? Did they have multimedia ministries putting together slick presentations on national television promising blessing if you will just give a minimum donation of $_______ dollars?!? Sigh. Let’s continue . . .
Let’s look at a couple of words in the above excerpt from the text. First let’s look at the word grandiosities. This is a word that is only used a couple of times in the text, here and in Y’hudah (Jude). It is the Greek word ὑπέρογκος huperonkosor phonetically hoop-er’-ong-kos. It means excessive, bombastic, great swelling, something astounding . . .
Brothers and Sisters, this is blasphemy!!! This is false teaching! “I AM like Most High” . . . ring any bells?!? This was the pride of Satan – this is why he fell . . .
Why is Bradley taking them down if they are the truth and not false teaching? Not the impact the GOSPEL of Yeshua (Jesus) has made on their lives, the impact PAULA has made on their lives . . .
Kenneth Copeland, Larry Huch and Paula White are just 3 of very many false teachers promising empty wells – dry cisterns. They promise wealth mouthing “grandiosities of nothingness.” TBN is an empty well that has followed the way of Balaam. They have abandoned the Living Water for the empty well of the prosperity gospel and they promote a plethora of others that do it as well. Let’s look at the second word, nothingness, in Kefa’s (Peter’s) statement: “Mouthing grandiosities of nothingness.” The word translated as nothingness here in the text is the Greek word ματαιότηςataiotēs. It means futility, vanity, depravity . . . more succinctly and to the point, worthlessness! Based upon the Greek understandings for the words used in the text here by Kefa, we could call it arrogant depravity, or better yet, prideful worthlessness. In other words, waterless springs or dry wells. entrap – lure – entice . . . In other words, they trick people. Is this how the Gospel of Yeshua (Jesus) is to be shared? By tricking people? Is Living Water not enough? It isn’t if your message is false . . .
How do these false teachers try to trick people into following their message – into picking the dry wells and cisterns over the Living Water? By luring and enticing them using their old nature . . . . The nature that wants – the nature that is greedy – the nature that covets . . . the nature and human standard (worldliness) that they turned away from, escaped from, and forsook to follow Messiah and the godly standards he commands (Holiness). They do this to seduce them. To seduce them just like a prostitute does. She promises love. She promises a good time. They are empty promises. They are empty because she is a waterless spring – and empty well. They are going after the new believers and those that don’t know the text!!! They are wolves picking off the weakest lambs and slaughtering them! Brothers and Sisters, Kefa couldn’t be more clear! False teachers are going to hell and they are going to try to take as many of you with them as they can! Does THAT ring any bells? False teachers will set their sights on, and especially target, those who are beginning, and those that have begun, to turn from their sin and worldliness towards God. when they do this to further entice you. 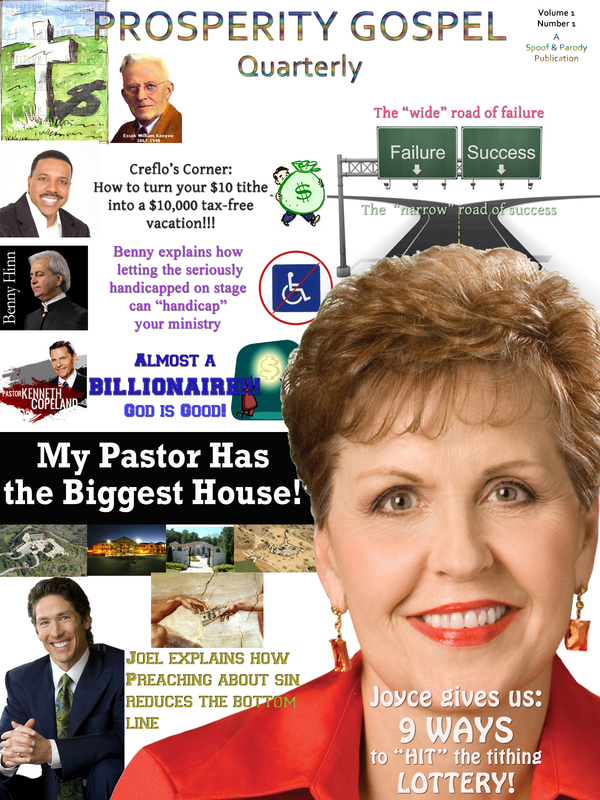 Joyce Meyers is another one of the false teachers that teach prosperity and freedom through wealth. Joyce Meyers also teaches the same “little gods” doctrine that Kenneth Copeland, Creflo Dollar and others in the prosperity gospel teach. Joyce Meyers tells you she is no longer a sinner . . .
and purify us from all wrongdoing. your heart is already hardened towards the Creator. to follow the lie of the serpent over, and instead of, His truth! Greek philosophers often warned against being enslaved by one’s passions; the image could extend to those who exploited those passions (such as prostitutes). If false teachers are like prostitutes trying to seduce you away from the right path, then TBN would have to be in the role of being a pimp because it is TBN that promotes many of the false teachers that would lead you down the wrong path and empty well of the prosperity gospel. as they play on the desires of the old nature, in order to seduce with shameless greediness, specifically targeting new believers and believers without much biblical knowledge, people the text tells us, who have just begun to escape from those whose way of life is wrong. False Teachers are waterless springs and broken cisterns teaching a worthle$$ gospel . . . This entry was posted in False Teachers and False Teaching, Word Studies. Bookmark the permalink. 1 Response to A WORTHLE$$ Gospel . . .
Of course I am in total agreement. My question is…………..there are so many that believe these waterless springs. I believe its because its more comfortable than thinking/realizing it may not be in Gods Plan for you to have all that you want …………that’s one reason. Anyway, I know that telling these prosperity followers about the waterless spring hasn’t worked for me…………and with all the hate and separation going on these days, I don’t feel arguing works either………..any suggestions?